ENGLEWOOD, Colo., June 12, 2018 /PRNewswire/ -- DISH today introduced new Amazon Alexa voice capabilities that give customers the ability to set recordings, launch apps and navigate menus on Hopper family set-top boxes. This update enhances the Hands-Free TV™ experience by building on DISH's existing Alexa voice functions, including the ability to play, pause, fast-forward, rewind and search content. "We are working to create the best Hands-Free TV options for our customers, and these new voice capabilities are an important step in that direction," said Niraj Desai, DISH vice president of product management. "DISH customers already love the convenience that our Alexa compatibility brings to their home, so we're continuously identifying popular voice commands to enhance that experience." In April 2017, DISH became the first pay-TV provider to offer direct compatibility with Amazon Alexa. In October 2017, the company unveiled whole-home Hands-Free TV by extending Alexa support to all Joey clients. DISH customers can ask Alexa to navigate, play, pause, fast-forward, rewind and search content based on channel, title, actor or genre. With DISH's newest update, customers can also use Alexa to set recordings, launch apps like Game Finder, Netflix, Pandora and YouTube, and easily access the Home, Guide, DVR, On Demand, Settings and Help menus. "Alexa, go to my Home Screen"
"Alexa, go to my DVR"
All DISH customers with an internet-connected Hopper DVR (all generations), Hopper Duo, Joey (all models) or Wally can ask Alexa to control their TV content after pairing with an Amazon Echo, Echo Show, Echo Dot, Fire TV Cube or another Alexa-enabled device. Each DISH set-top box must be paired with its own Alexa device. 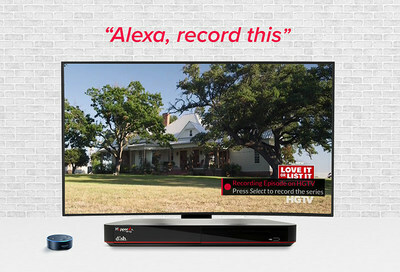 For more information about the Alexa integration with DISH, including possible commands and set-up instructions, visit www.dish.com/AmazonAlexaIntegration.